The transgender author spills what it is like to walk the path of transsexuality. Ever wonder what goes in the life and mind of a man who makes the transition to woman and what becomes of him… or her afterwards? Read about it in the memoir “Enigma: Excerpt from My Diary” (Page Publishing; 2018) by Terrie Adams. Adams’ story of her transition from male to female is narrated through excerpts from her diary. However, due to certain circumstances, some dates and follow-ups are missing; but the truth of what had been her life is told in the book, including entries from her childhood. The author does not convey her transgender journey through rose-colored glasses. She honestly and candidly speaks about the complexity of her transition and the joys and troubles of walking the path of transsexuality. Readers will be filled with sadness and compassion as Adams opens up about her challenges and inexplicable pains in living out her true sexuality in a society that is filled with taboos, intolerance, and discrimination. Halfway along the journey came more pain and disappointments. The struggles showed her the path of discernment. Finally, she was able to live a life that reflects her authentic self and became stronger mentally and much more confident and without any fear of contradiction. She no longer had to battle with her feelings and hide her true self. Be inspired by Terrie Adams’ journey of discovering her true self. 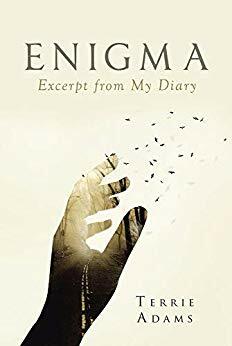 Order “Enigma: Excerpt from My Diary” today through Amazon and Barnes & Noble. Await the public display of this heartwarming memoir at the upcoming Los Angeles Times Festival of Books on April 13-14, 2019 at the University of Southern California in Los Angeles, CA. Publisher | Page Publishing, Inc.